Signature Dishes – many restaurants become known for their signature dishes (i.e., “Have you had the Lasagna at Trattoria Roma?”). These dishes are unique offerings that the restaurant becomes known for, and that new diners cannot wait to try. A restaurant’s signature dish helps define their menu and purpose…and ultimately drives new customers to their establishment. Anchor Tenants – Most malls and large retail establishments actively court big brand, well established tenants as “Anchors”. Why? Because these anchor tenants help define the mall and give shoppers a primary reason to go there. If you are trying to establish a high end shopping experience and attract wealthier patrons, then you will need to find high end anchor stores that will attract the right audience. Once the shoppers are at the mall, they then will visit the smaller stores as they walk around. Lead-In Audience – TV Networks have used a variation of “Foundation Content” in their strategies for years. Most TV networks establish a core set of shows/series that draw a good audience. The TV networks then strategically schedule newer shows around these top shows in hopes of building a strong lead-in audience that will also enjoy the newer show. If the newer show develops a strong following, the network will often move it to another time/day in hopes of repeating the process. Timeless – If you create the right kind of Foundation Content – it will be timeless in its appeal. Many blog posts and website articles are news related or quick tips focused. Foundation Content, by design, is meant to be of great value – a valuable resource that readers will want to refer to again. It should also have a lifespan of years versus days. Traffic – Ultimately, your Foundation Content will become a primary driver of traffic to your site. If you choose the right topic and develop a great resource, other readers will find it. Other sites will link to it and send you interested readers. Repeat Visitors – The right content will drive repeat visitors to your site. The article itself will be a reference resource that will be visited multiple times. The article will also direct the reader to complementary content on the site that they will want to come back to. Awareness – The quality of the article will help establish your reputation in the marketplace. This reputation will help build your brand and heighten your awareness to potential readers. Your site can become known for the place to go to solve problems. Conversion – If the intent of your website/blog is to earn money, then foundation content can be a critical component. In your article you may be recommending products or encouraging readers to subscribe. Whatever your money making approach is, this content will surely play a key role. Keyword Research – Oftentimes, doing keyword research can help you with your brainstorming. In this case, keyword research means evaluating what web users are searching for on the search engines. Keyword research can help you identify topics and help you understand the potential traffic that an article could generate. Keyword research can also help you identify how competitive the topic is. The two best tools for keyword research are Google’s keyword tool and Market Samurai. Answer the Burning Questions – Another way of determining what your Foundation Content topics should be is to identify what the key questions are being asked about your niche. If specific information on your niche is hard to find or confusing to readers, then this may make for a great topic. Information that is readily available and easily understood is a waste of your time. To identify the key questions in your niche start by asking yourself what was confusing to you when you started. Also, look at various forums/message boards to see the types of questions that get asked over and over again. Finally, visit the various question and answer sites (like Yahoo Answers and Quora) to see what people are asking. How To/Tutorial – Step by step guides are a great approach to developing Foundational Content. If there are processes in your niche that are not well understood or documented, these make for great tutorials. Adding pictures and videos will also dramatically help. Resource List/Top 10 – Another great concept is to develop a list of valuable resources or a list of actionable items/tips. These types of articles do very well in search engines and readers seem to be drawn to them. Just take a look at the front cover of any magazine – it will surely have a resource list as an attention getting article. Case Studies/Research – Many niches are well served by documenting how you have tacked a particular problem. Case studies can serve two purposes: (1) they lend to your credibility because you are showing the reader how you personally have worked through a problem similar to theirs, and (2) they guide and motivate the reader to solve their problem. FAQs – Compiling a list of questions and answers can work great if done well. FAQs on a specific topic will work well if the answers are thorough and if the navigation of the FAQs is easy and intuitive. When readers search for answers via search engines, they are often directed to forums and question/answer sites. Unfortunately, the responses on these sites are often inaccurate, confusing or poorly presented. If you can present these answers in an easy to use manner, you will succeed. Uniqueness – Chances are your topic has been covered elsewhere by someone else. In order for you to stand out, your content has to be unique. Uniqueness and originality can be accomplished in many ways: strong opinions, fresh perspectives, depth of details… There are many ways to present the information in a manner that is better (and different) than the others. Powerful Titles – The title of the article is the single most important piece of content. The title will impact whether the search engines rank your article. The title influences whether your subscribers will click on your link. If you pick a boring, unimaginative title, your article will not become Foundation Content. SEO Friendly – Making the content SEO friendly will help you bring new readers to your site. The key is to choose a key phrase for your article that you are targeting. This search phrase should appear in the article’s title, description and URL. Clean Format – Online readers tend to scan articles to see what interests them. Your article needs to be presented in a way that draws users to the key information that they are looking for. Strong Images – Strong supporting graphics can make or break an article. If you have an article that is trying to educate readers on hard to grasp concepts, then perhaps an illustration would help. Likewise, screen captures or photos are required for How-To and Tutorial articles. You should now have a strong understanding of the power of Foundational Content. 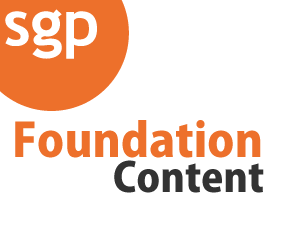 Foundation Content is what draws visitors to your website – and keeps them coming back. With a strong foundation of content, your readers will respect your expertise and tell others.